The opposition parties that called themselves Pakatan Rakyat (PR) expected yesterday’s Blackout 505 or Black 505 illegal demonstration in Padang Merbok, Kuala Lumpur to be their biggest demonstration ever. The opposition parties brought their supporters from other parts of the country to the demonstration venue, hoping to show to the foreign reporters that most Malaysian supported them even though we are facing a hazardous haze problem in Kuala Lumpur. 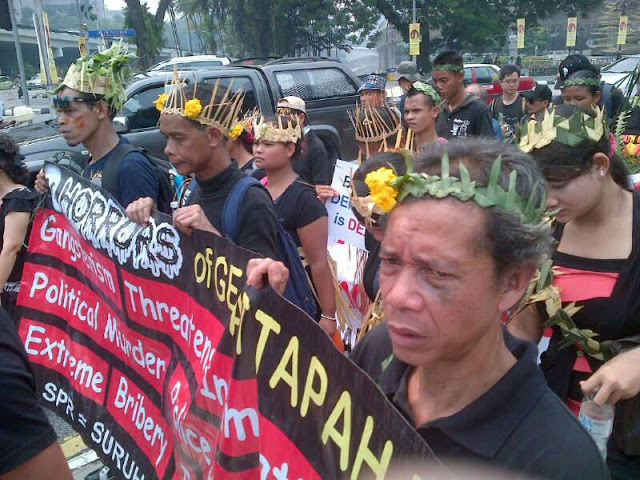 They even brought in the Orang Asli or the Malaysian aboriginal people to take part in the illegal demonstration by carrying some banners written in English! 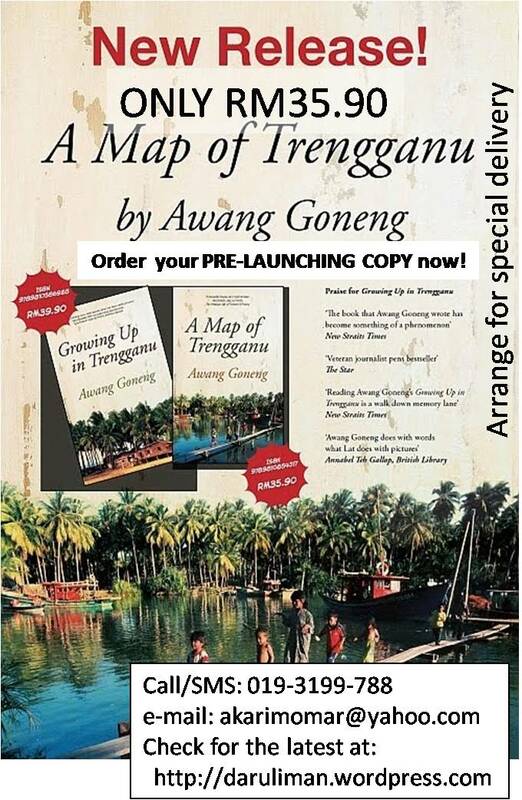 Did the Orang Asli wrote the banners themselves? It is very funny when the illegal demonstration’s organisers gave the Orang Asli English written banners to be carried around; may be they thought that the Orang Asli communicate in English instead of their native languages and the Malay language. DO PR LEADERS CARE FOR THEIR SUPPORTERS? Kuala Lumpur is facing a hazardous haze that we have to close our doors and windows to avoid the haze. And when PR ordered their supporters to go outside for hours to demonstrate, the demonstrators could face health problems just because of taking part in that illegal demonstration. 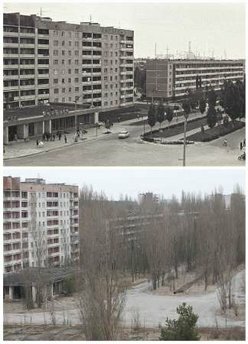 Look at the buildings in the circle. Do they look clear? DO THE DEMONSTRATORS CARE ABOUT THEIR CHILDREN? Some of the demonstrators brought along their kids with them, some in Blackout t-shirts. But do they really care about them? 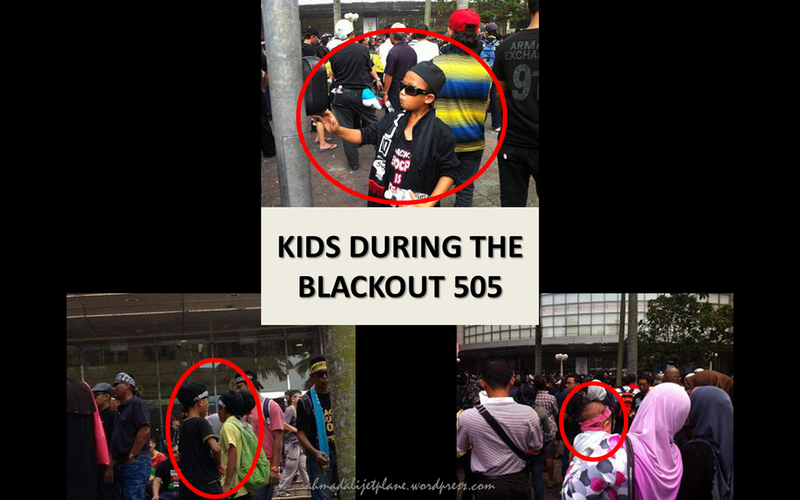 If this illegal demonstration turned into a riot like Bersih 3.0, the children could be badly injured. And some kids could be facing asthma problems (like me) and being outside in the haze for hours could make us sick. DO THE ORANG ASLI UNDERSTAND WHAT THEY ARE DOING? 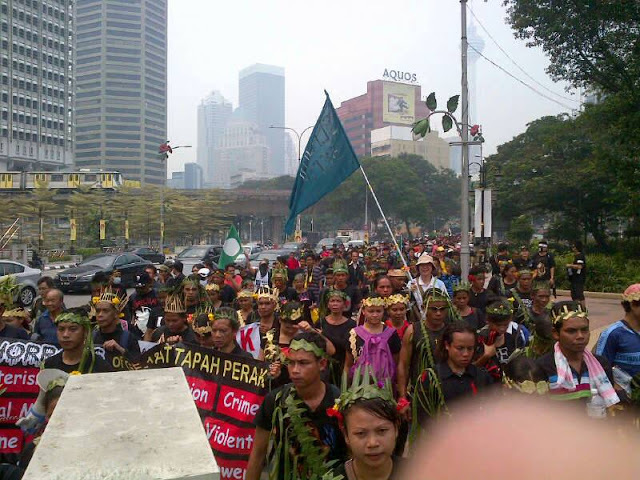 The Orang Asli that joined the demonstrators at the Masjid Jameq were reportedly led by an Indian. They were holding banners written in English! But do they understand what their banners say? If they wrote the banners themselves, will the banners be written in English? If they are the educated Orang Asli, they’ll be able to understand English but the traditional Orang Asli could not, the same as most people from the traditional villages away from the do they really understand what they are doing and the reason why they participated in the illegal demonstration? Take a good look at the banner. If they prepared the banner themselves, will the banner be in English or Malay? Here’s a closer view. I do not think the words such as ‘murder’ and ‘bribery’ that is written on the banner exist in either the Malay or their native language vocabularies. The flags were similar to the ones used by the illegal Parti Komunis Malaya’s (PKM). 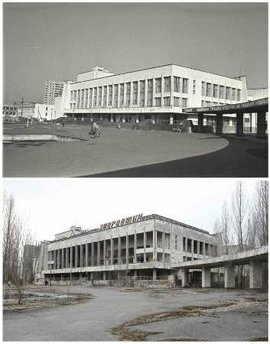 So what is the connection between the Pakatan Rakyat and the communists? 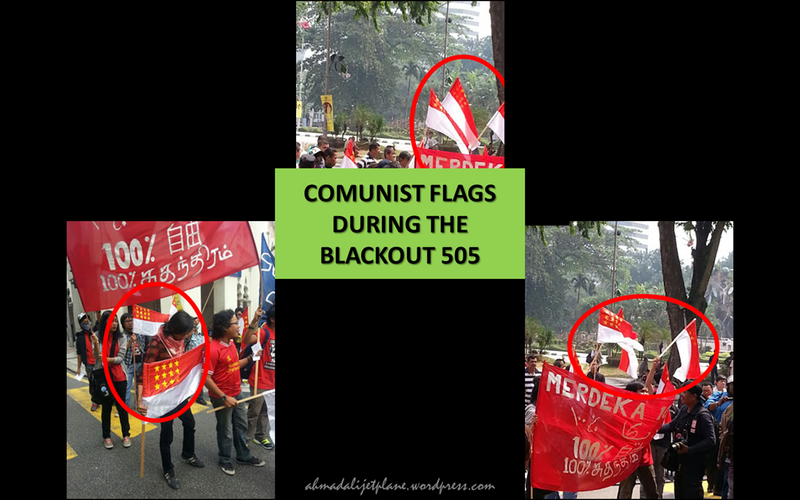 Flags in the circle were similar to the ones used by the communists in Malaysia. 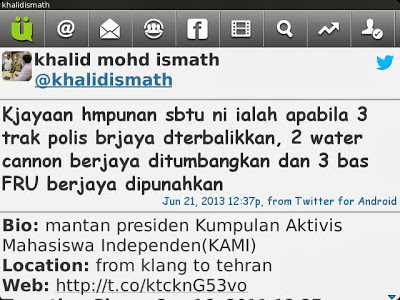 Khalid Mohd Ismath is one of the main PR’s illegal demonstration activist. His tweet called for a riot! They wanted to destroy the FRU busses, they want to destroy the water cannon, and they want to over turn trucks not only cars like in Bersih but trucks! 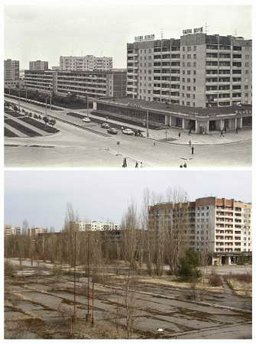 ARE THEY TRYING TO TURN BLACK 505 INTO SOMETHING LIKE ARAB SPRING? I saw a photo of a demonstrator carrying the Syrian flag. 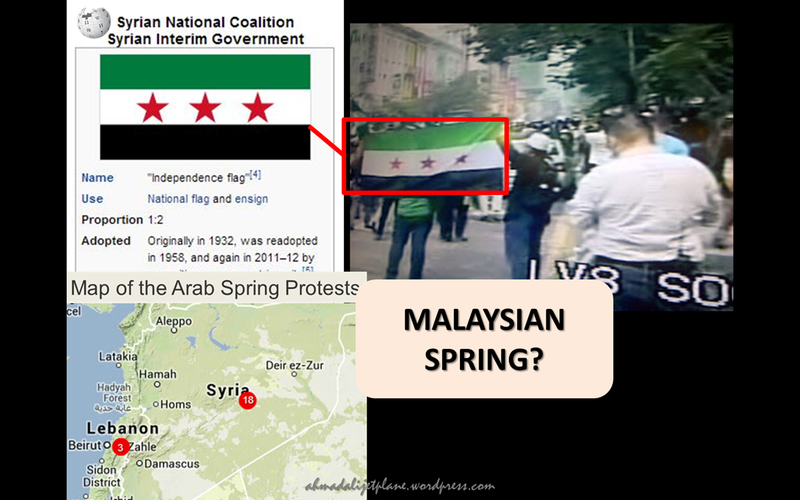 But why must a flag of Syrian be waved in that illegal demonstration? 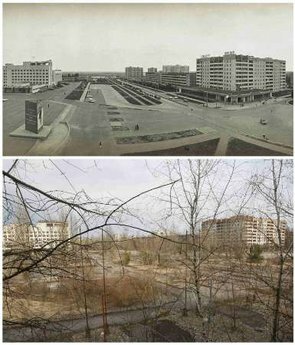 Is it because of they want to start something like the Arab Spring? 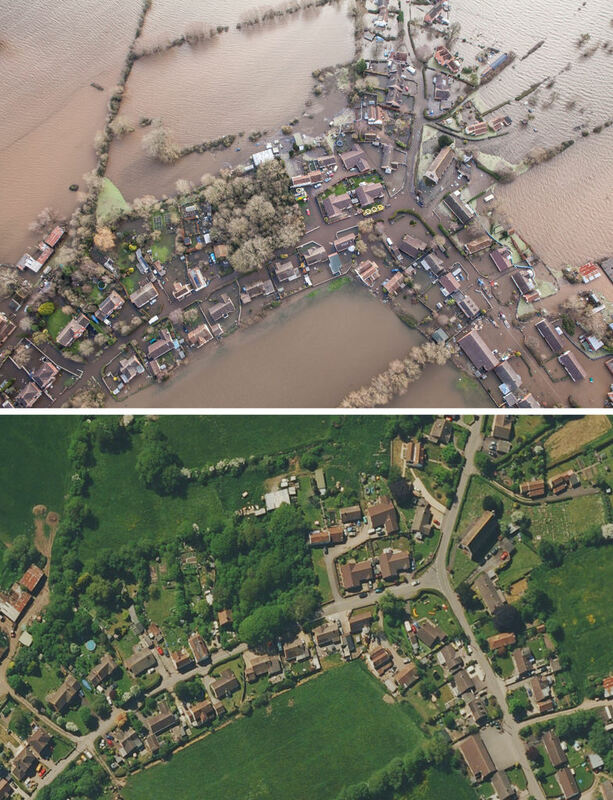 Is PR trying to make this like the Arab Spring. 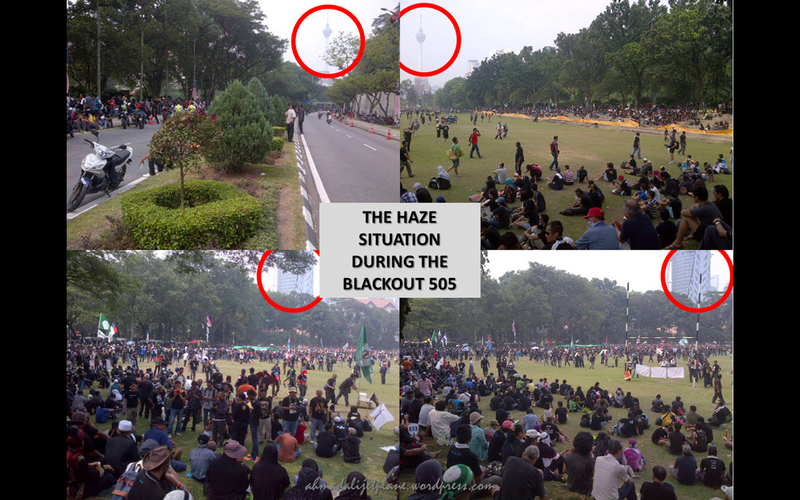 Himpunan BLACKOUT 505: A “Peaceful Demonstration”? Say NO! to BLACK 505 and the Pakatan Rakyat! Malaysian’s 13th General Election is over but the opposition parties in Pakatan Rakyat who lost the election wants to use street demonstrations, violence and other illegal ways to topple the legal government. 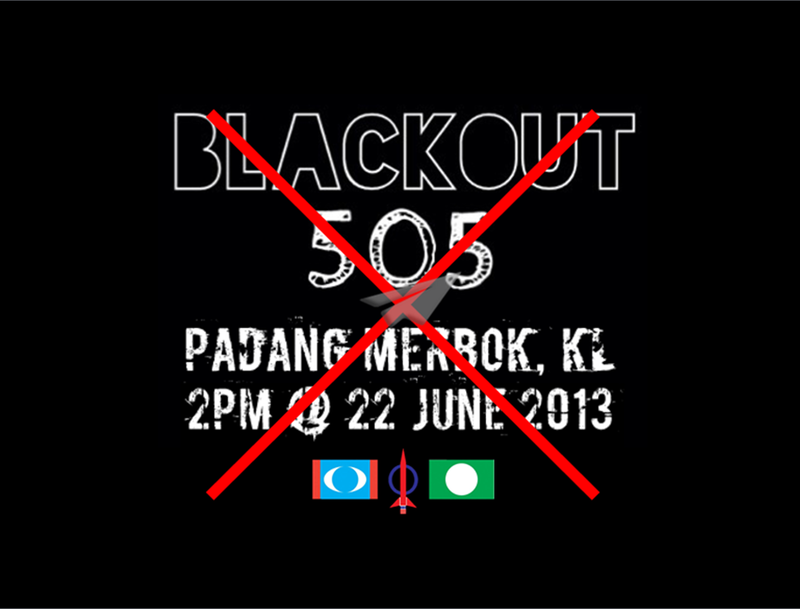 Today Pakatan Rakyat will stage another illegal demonstration against the 13th General Election’s results, called BLACKOUT 505. The demonstration is against the law because it is in conflict with the Peaceful Assembly Act 2012. In fact most of the opposition’s demonstrations and rallies are illegal and against the law because the opposition parties’ leaders do not understand that we have to obey the laws of any country we are in. PKR claims that today’s illegal demonstration which will be held in Padang Merbok, Kuala Lumpur will be a peaceful demonstration. A peaceful illegal street demonstration? Demonstrators thew all kinds of things towards a moving police car and attacking the car. The photo shows demonstrators kicking the car and someone climbed onto the car kicking the windscreen. They then hit the driver and a reporter who tried to help the bleeding policeman. Are they peaceful people? 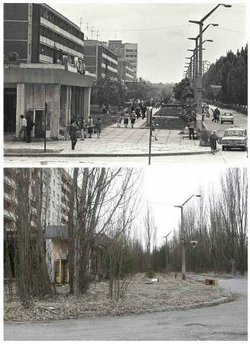 They always promised a peaceful street demonstration; anyway most of their street demonstrations are not peaceful and they would blamed others for the bad things that they had done. I think their idea of a peaceful illegal street demonstrations are the kinds of demonstrations that were held in Cairo, Istanbul, and in Rio de Janeiro. Then they will start a fight, hoping that the foreign reporters will report that the Malaysian Police and government are bad, undemocratic and unfair toward the demonstrators and the oppositions. Did the opposition leaders care about the demonstrators who supported them and might be killed in the stampede as they were pushed through the barricades into the Dataran Merdeka? And today, with the hazardous haze problems in Malaysia, the opposition leaders are just happy to let their members and supporters risking their health by walking, running, shouting and doing crazy physical activities for hours in the hazardous haze that can cause them health problems. Even McDonald had postpone their Olympic Run 2013 at the same location tomorrow due to the haze problem. 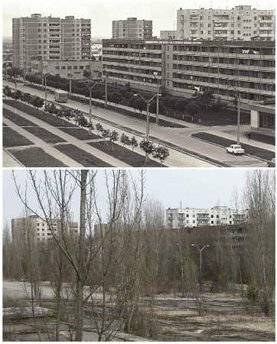 I just hope that they will not bring children along even with face masks. 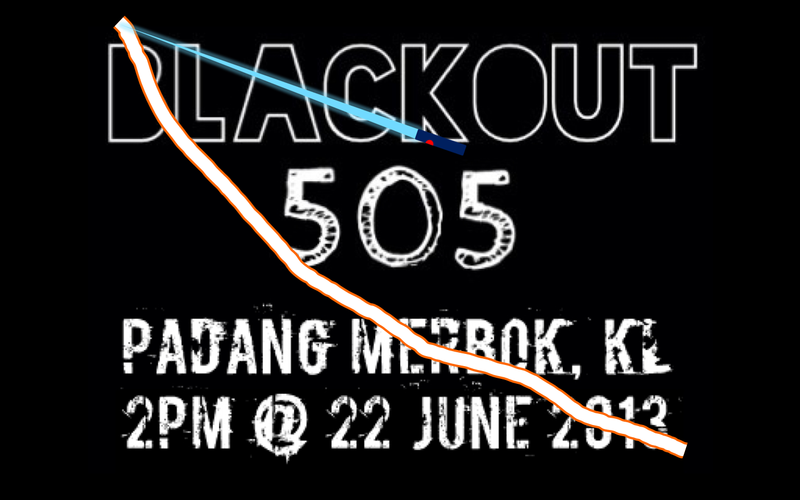 That is why we should say, “NO!” to BLACKOUT 505 and to Pakatan Rakyat! A recording of the incident of “Barua-barua Yahudi” and “Pengkhianat Kepada Agama” interrupting Tuan Haji Naser Disa’s talk on “Ancaman Terhadap Kedaulatan Islam Agama Negara” during the Seminar Mendaulatkan Islam Agama Negara (SEMAIAN) on 6th April 2013 in Dewan Besar Institut Tadbiran Islam Perak (INTIM). If they disagree with the speaker, they should go to the microphone and talk politely; instead of shouting like the Bersih 3.0 demonstrators. But birds of a feather, flock together, after all they are from the same group of people, the supporters of the opposition parties so-called the Pakatan Rakyat. 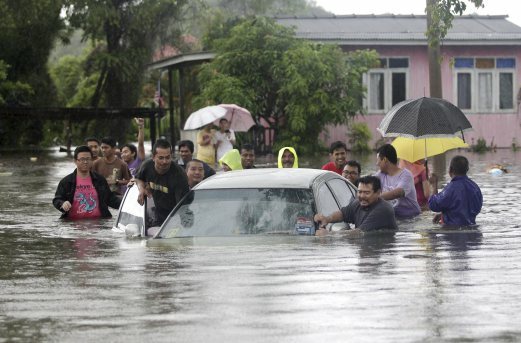 Coming Up Next … Himpunan Kebangkitan Rakyat! PAS leader Mohamad Sabu (4th from left) taking part in the Janji Bersih demonstration, on the night of Merdeka Day, 2012. Mohamad Sabu or Mat Sabu said that Pakatan Rakyat is going to organise ‘Himpunan Kebangkitan Rakyat’, to demand the government to comply all the demands made by Bersih, at the Stadium Bukit Jalil on November 3, 2012. A new demonstration to demand for Bersih agendas? But PR leaders said that they had nothing to do with Bersih. So, another demonstration by PR? The opposition parties really love to organise anti government demonstrations. How many more demonstrations do they plan to make and who will join them? But, if ‘Himpunan Kebangkitan Rakyat’ is going to be held on November 3, some Muslims will still be in Makkah or Madinah for Hajj. What will PAS other leaders say about it? PAS made a huge issue accusing the Prime Minister for making a plan to conduct the 13th General Election during the Hajj season so that PAS members who go for Hajj will not be able to vote. PAS leaders condemned the PM when actually they were the ones who made the guess of when the 13GE will be held! So now, are they not Islamic as they accused the PM or are they telling their members not to go for Hajj or are they being unfair to their members for organising such a huge event when some of their members are away? PAS should dakwah their members to go for Hajj and not to take part in demonstrations. By the way, will YB Ngeh Koo Ham be saying anything about this (please click here for Ngeh’s comment about peaceful protest)? Peaceful Assembly Over ‘Innocence of Muslims’ Is A Waste Of Time But Bersih Is Not? Perak DAP chief Datuk Ngeh Koo Ham angered lots of Malaysian Muslims when he asked whether Muslims were “wasting time and energy” in protesting against ‘Innocence of Muslims’, a film that insults Prophet Muhammad (PBUH). He was referring to a peaceful assembly which will take place on Friday over the matter. As a leader, YB Ngeh Koo Ham must understand that insulting Prophet Muhammad (PBUH) and Islam is a very serious matter to the Muslims. And he also must remember that Islam is the religion of the Federation of Malaysia and all leaders must respect our constitution. And good Muslims do not insult other religions and cause violence while protesting for our rights as misunderstood by some people. So how about Bersih and other PR’s demonstrations? Has YB Ngeh Koo Ham ever ask the question if taking part in Bersih 3.0 illegal demonstration was “wasting time and energy”. 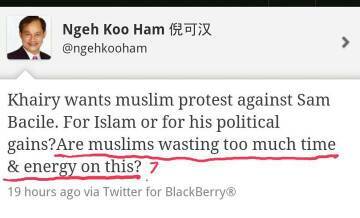 And now YB Ngeh Koo Ham said that some people had twisted the meaning of his tweet. I think that he should not tweet the question especially when DAP together with PAS and PKR took part in lots of demonstrations that sometimes turned violent. Another non Muslim leader, MCA deputy president Datuk Seri Liow Tiong Lai said that Ngeh’s comments reflected insensitivity towards the feelings of Muslims. I am scared if there are Muslims who think that taking part in demonstrations over political, freedom and human rights issues like Bersih is more important than fighting for Islam. I wonder what will PAS say about this matter and is PAS willing to leave the Pakatan Rakyat as suggested by YB Nasharudin Mat Isa? Bersih 4.0: Split Into Two Groups? 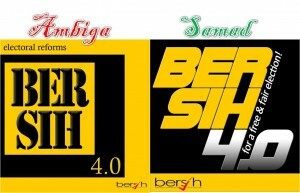 On the left is the Bersih 4.0 logo lead by Ambiga while on the right is the Bersih 4.0 logo lead by A Samad Said. Image from Suara Pakatan Rakyat. I’ve just read an interesting post from Suara Pakatan Rakyat, ‘Bersih 4.0: Mungkinkah Wujud 2 Kumpulan?‘. Is it true that there will be two groups of Bersih 4.0 demonstrators? The article said that the first group will be led by A Samad Said and supported by PAS and PKR while the other group is supported by DAP and will be lead by Ambiga. 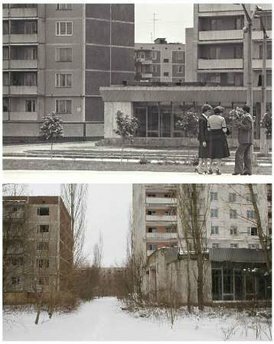 Are the two groups are not happy with each other? Will they be blaming each other if things turned bad as in Bersih 3.0? Does ‘Demi Rakyat’ Supports Gay? PR, Please Don’t Lie During Ramadhan! Does PAS Still Like YB Nasharudin? Muslims should never tell lies, especially during the holy month of Ramadhan. Does PAS follow the Orange Book or the Islamic Law? Is Malaysia an Islamic country? Islam is the religion of the Federation of the Malay States of Malaysia but PAS says that Malaysia is a secular country. Is PAS teaching their supporters the true Islam or is PAS actually using Islam to win their supporters votes? PAS claims that Malaysia is a secular country, told people that supporting UMNO is haram, UMNO is not fighting for Islam and Muslims, let the non-Muslims use the word Allah, said that it is ‘wajib’ to join Bersih 3.0 and a lot of other lies which are actually against the Islamic teaching. Is Malaysia a secular country? 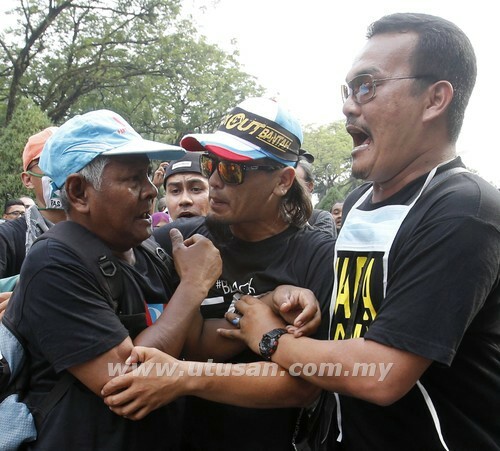 Did PR plan Bersih 3.0 riot? Does PAS fight against LGBT? Does PAS fight against Syiah? Is there no corruption in PAS and PR? Do the PAS leaders ever lie to their supporters? Do PAS leaders trust and really like DAP and PKR? Is PAS lying about FGVH shares? PAS claimed that FGVH will not be profitable and took part in Himpunan Oren but Kedah PAS’s government bought and made lots of profit from FGVH shares. Did PKR protect the Rights of the Muslims by serving halal and non-halal food together during the dinner with Anwar? Did PR plan the Bersih 3.0 riotand who started the Bersih 3.0 riot? Did Anwar signal Azmin to break the barricades during Bersih 3.0? Do PKR leaders never lie and always tell the truth? Does PKR support LGBT, Liberalism and Pluralism and the Rights to become murtad? Will PKR be buying MPs to win the PRU 13? Is it true that there are lots of corruptions in PR government? Ustaz Azhar Idrus, A PAS Candidate for PRU 13?